We offer a wide range of successful volunteer programmes in primary and secondary schools in London, for teams and individual employees. You will be fully supported and we will provide the materials, training, expertise and guidance throughout the process. The only thing volunteers need to bring is enthusiasm! As a charity we ask businesses participating in our programmes to make a contribution to help cover the costs of delivering our programmes in schools. The contribution will depend on the number of volunteers and the type of activity they are taking part in. We are also able to discuss reduced rates for not-for-profits, public sector organisations or small/micro businesses. We are happy to invite you and a small group of your colleagues to take part in our employability skills workshops for free in the first instance, to try out what we do. To discuss volunteering on our programmes or to try out our events contact us or call 020 7655 0300. 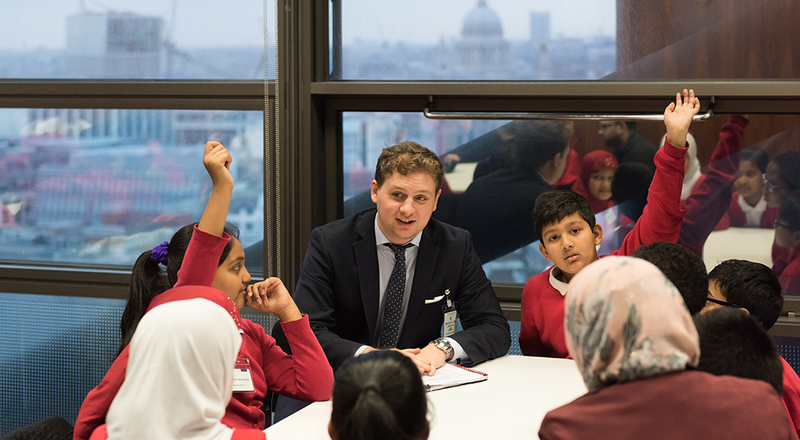 If you are an Existing Corporate Partner and would like to book volunteer places on one of our secondary school workshop events click here, or to book places on a training event for our primary school programmes contact us here. Primary Partner Schemes: Inspire a child to fall in love with reading or maths and help them develop essential skills for academic and professional success. Spend a day or half day workshop with secondary or sixth form students de-mystifying CVs, interview techniques or UCAS applications. Skills for Life: Help young people develop communications, research or financial literacy skills, or think about their career options. Help our Alumni Network members access careers advice, employment opportunities and professional networks. Becoming an Annual Partner gives access to our wide range of volunteering programmes, training and support throughout the year. Annual Partners can choose the dates and times that suit them from our calendar of popular secondary school workshop events, set up a regular volunteer programme for a group of volunteers in a primary school or secondary school, or get involved in all our core programmes. Annual Partnership can range from a small group of employee volunteers to some companies who have hundreds of their employees volunteer with us each year. To discuss volunteering on our programmes and for more information on Annual Partnership contact us or call 020 7655 0300. We welcome businesses who want to arrange a one-off volunteer opportunity – perhaps as part of your company Volunteer Week or Day of Giving, or as a team building activity. Get in touch with us to discuss how your group could be accommodated on one of our existing volunteer events or how we could create a bespoke activity.